COATINGSPRO MARCH 2016 53 inert corrosion cells, he said. Tey used abrasive blasting and were able to stay on schedule. Admirable Report Sanchez's process was to do ultra-high pressure water jetting using Jetstream of Houston equipment to remove any salts from the substrate. Next, he followed that up with steel shot blasting using centrifugal Blastrac and GOFF equipment. "Tis method is the most efcient and expedient way to adhere to the ship's schedule," he said. Next, Sanchez was ready for the non-skid coating to be applied, but there was an important step he had to take frst. "No application could be started until we briefed a one-star admiral," he said. Tis sounds like an intimidating prospect, but Sanchez had done his homework. 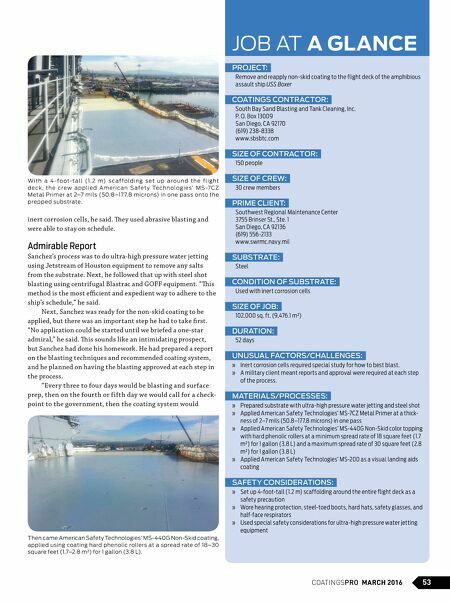 He had prepared a report on the blasting techniques and recommended coating system, and he planned on having the blasting approved at each step in the process. "Ever y three to four days would be blasting and surface prep, then on the fourth or fifth day we would call for a check- point to the government, then the coating system would Then came American Safety Technologies' MS-440G Non-Skid coating, applied using coating hard phenolic rollers at a spread rate of 18–30 square feet (1.7–2.8 m²) for 1 gallon (3.8 L). 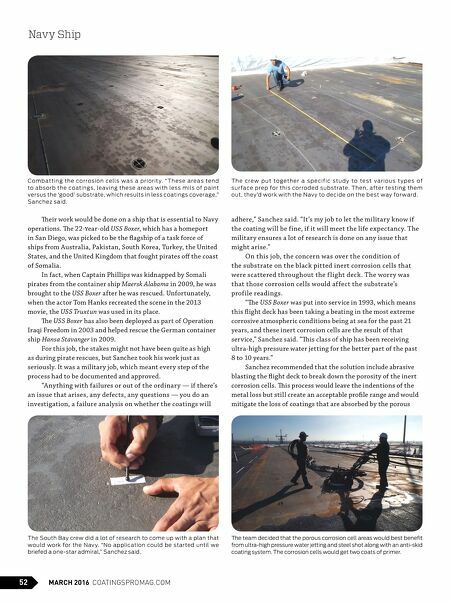 JOB AT A GLANCE PROJECT: Remove and reapply non-skid coating to the flight deck of the amphibious assault ship USS Boxer COATINGS CONTRACTOR: South Bay Sand Blasting and Tank Cleaning, Inc. P. O. Box 13009 San Diego, CA 92170 (619) 238-8338 www.sbsbtc.com SIZE OF CONTRACTOR: 150 people SIZE OF CREW: 30 crew members PRIME CLIENT: Southwest Regional Maintenance Center 3755 Brinser St., Ste. 1 San Diego, CA 92136 (619) 556-2133 www.swrmc.navy.mil SUBSTRATE: Steel CONDITION OF SUBSTRATE: Used with inert corrosion cells SIZE OF JOB: 102,000 sq. ft. (9,476.1 m²) DURATION: 52 days UNUSUAL FACTORS/CHALLENGES: » Inert corrosion cells required special study for how to best blast. » A military client meant reports and approval were required at each step of the process. MATERIALS/PROCESSES: » Prepared substrate with ultra-high pressure water jetting and steel shot » Applied American Safety Technologies' MS-7CZ Metal Primer at a thick- ness of 2–7 mils (50.8–177.8 microns) in one pass » Applied American Safety Technologies' MS-440G Non-Skid color topping with hard phenolic rollers at a minimum spread rate of 18 square feet (1.7 m²) for 1 gallon (3.8 L) and a maximum spread rate of 30 square feet (2.8 m²) for 1 gallon (3.8 L) » Applied American Safety Technologies' MS-200 as a visual landing aids coating SAFETY CONSIDERATIONS: » Set up 4-foot-tall (1.2 m) scaffolding around the entire flight deck as a safety precaution » Wore hearing protection, steel-toed boots, hard hats, safety glasses, and half-face respirators » Used special safety considerations for ultra-high pressure water jetting equipment W i t h a 4 -f o o t-t a l l (1. 2 m) s c af f o ld i n g s e t u p a r o u n d t h e f l i g h t d e c k , t h e c r e w a p p li e d A m e r i c a n S af e t y Te c h n o lo g i e s' MS -7C Z Metal Primer at 2–7 mils (50.8–17 7.8 microns) in one pa ss onto the prepped substrate.